Prayer is one of the most important of the spiritual disciplines, but one of the most difficult to implement in our lives. We make time to communicate with loved ones and friends, so why is it so hard to make the time to communicate with the one who loves us the most? I know of people who can sit for hours at a time in prayer and meditation. I don’t believe that we are all called to this type of prayer life. We are, however, called to pray without ceasing. 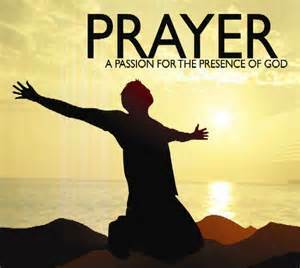 I can tell you from personal experience that God does answer prayer. I love to talk to God during the day. I love to share my life with my heavenly Father through constant prayer. I encourage you to go to the Father in prayer and see what happens. 5 “And when you pray, do not be like the hypocrites, for they love to pray standing in the synagogues and on the street corners to be seen by others. Truly I tell you, they have received their reward in full.6 But when you pray, go into your room, close the door and pray to your Father, who is unseen. Then your Father, who sees what is done in secret, will reward you. 7 And when you pray, do not keep on babbling like pagans, for they think they will be heard because of their many words. 8 Do not be like them, for your Father knows what you need before you ask him. 13 Is anyone among you in trouble? Let them pray. Is anyone happy? Let them sing songs of praise.14 Is anyone among you sick? Let them call the elders of the church to pray over them and anoint them with oil in the name of the Lord. 15 And the prayer offered in faith will make the sick person well; the Lord will raise them up. If they have sinned, they will be forgiven.